Davontae Sanford’s new legal team filed an affidavit in court from an imprisoned hit man who says that he—not Sanford—killed four people in a Detroit drug house, the Associated Press reports. The sworn statement is part of a motion for a new trial. Vincent “Vito” Smothers underscored in the affidavit that he has “nothing to gain” from his confession. “I only want to tell the truth in order to prevent an innocent kid from serving time for crimes that I committed,” said Smother, 34, who is currently in prison for killing eight other people. Sanford was 14 years old, illiterate and blind in one eye at the time of the murders. His new lawyers blame poor legal representation for the teenager’s false confession and guilty plea to second-degree murder at his 2008 trial. 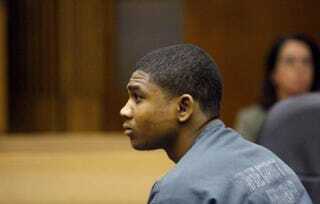 Sanford is now 22 years old and serving 37 to 90 years in prison. Smothers said that he wants to testify in court to give details about the murders that only he knows. This isn’t the first time that the hit man confessed to authorities. According to AP, Smothers told its reporter in 2012 that he was willing to help Sanford, but a judge refused to hear his testimony. Sanford has previously tried to withdraw his guilty plea but been denied in court. The Michigan Supreme Court, however, did keep open the possibility of a new trial, ruling in 2014 that the plea had been improperly filed, according to the Detroit Free Press. Sanford’s lawyers said that the legal system is avoiding the truth. “For far too long, the truth in this case has been hidden and suppressed by Detroit police and prosecutors,” Megan Crane, a lawyer with Northwestern University’s Center on Wrongful Convictions of Youth, told the Free Press. The Wayne County Prosecutor’s Office continues to stand firm on Sanford’s conviction, according to the Free Press. A spokeswoman said that the prosecutor disagrees with the comments of Sanford’s lawyers. “However, our long-standing protocol is not to argue our cases in the press. We speak though our pleadings and will argue the case in open court,” she told the newspaper. Read more at the Associated Press and the Detroit Free Press.